NEW YORK (ANS) – Following the tragic fire and destruction of Notre Dame Cathedral in Paris yesterday (April 15), the New York-based French Heritage Society (FHS) has established a Fire Restoration Fund. 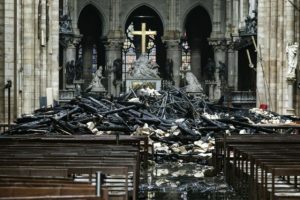 A cross stands amid charred debris in Paris’ Notre Dame Cathedral. Ludovic Marin – AFP – Getty Images. Elizabeth Stribling, chair of the French Heritage Society said, “Protecting the architectural legacy of France is at the very heart of our mission, and we must provide whatever aid we can to this cherished monument in a time of dire need. “We have established a Notre-Dame Fire Restoration Fund to allow those whose thoughts are with Paris to take immediate action to ensure that the cathedral’s storied history survives. This tragedy is an urgent reminder of the fragility of our rare architectural treasures and the vital work to preserve them for future generations. French Heritage Society’s recent emergency fund campaigns have raised close to $200,000, providing critical support for the destruction in the wake of Hurricane Katrina in 2005 and France’s centennial flooding in 2016. French Heritage Society, Inc., is a 501(c)(3) organization. Donations are tax-deductible under U.S. tax laws and eligible for tax credit under French tax laws. FHS is dedicated to protecting the French architectural legacy both in France and the United States with particular emphasis on preservation and education. It fosters long-established French-American relationships through cultural exchanges as it strives to ensure that the treasures of our shared heritage will survive to inspire future generations. Its 11 chapters in the U.S. and one in Paris have supported the restoration of nearly 600 buildings and gardens since 1982. FHS also organizes unique student internship opportunities in both countries.